← Got My Eye on You, My Kaotica Eyeball that is! Today marks a pretty big milestone for me. For the first time in over a decade, I will only have ONE JOB. That’s right. I have officially retired from promotional and demo work and am focusing solely on my voiceover…and it’s a full time job…like…that pays the bills! This is not a case of choosing to be a poor struggling artist either. I have work. It’s legitsies! I have had at least two jobs since 2003, and I’ve balanced between 2 and 6 part time, freelance and full time jobs during that time. For a few years, I was also a full time student. Talk about juggling your life around! 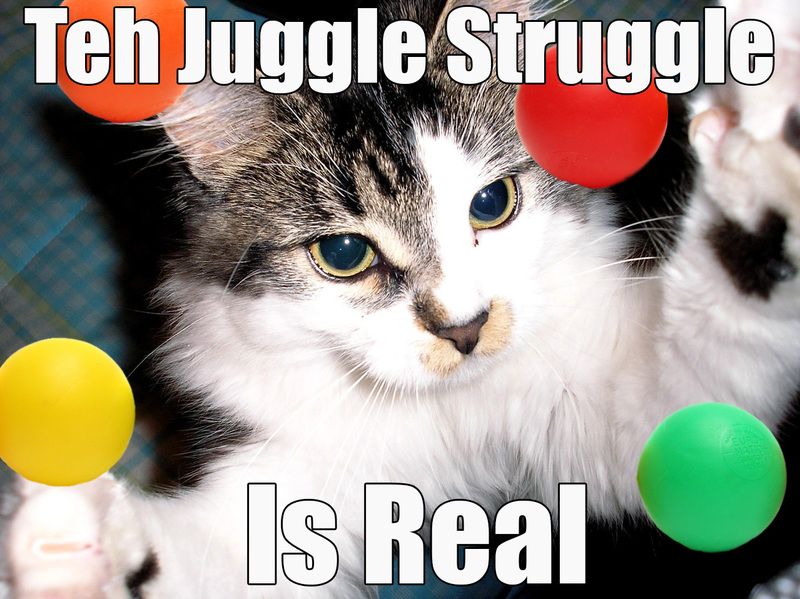 The juggle struggle was real, and my post-graduation journey was nothing like I thought it would be. I couldn’t find grown-up work, tried a receptionist job to get my foot in the door, hated the job and couldn’t get anywhere (as plenty of you heard about when this site was “Receptionist on the Verge.”). I started voiceover training on the side, experienced being laid-off for the first time, felt pressured and took another front desk job that underpaid me but at least brought forth great connections in VO, and experienced another layoff before embracing unemployment and looking at things differently. I stacked multiple gigs on top of each other to make ends meet, until now. 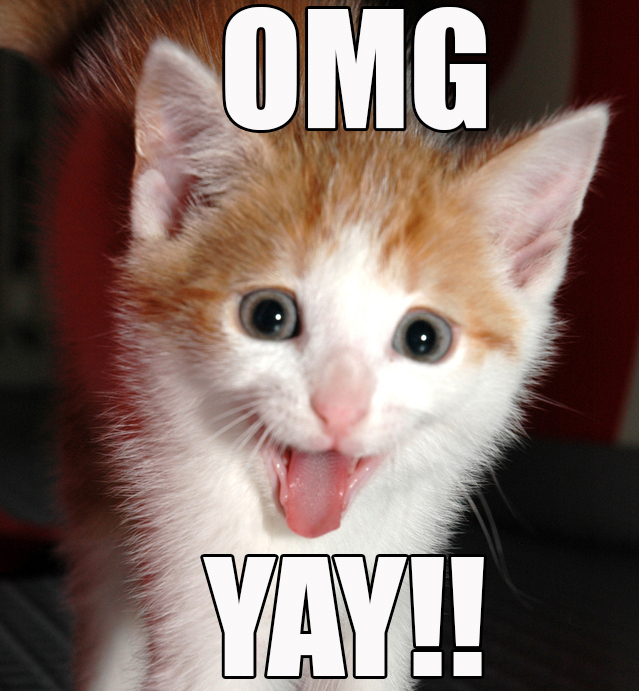 Now I have enough consistent VO work to do just the one thing I love! Yay! I’m so happy I found this awesome industry, where being me is what I do! There are so many wonderful people who helped me get to this point, and I am truly grateful for them and for every opportunity I found and grasped. I gotta say though, old fashioned, bootstrappers’ “logic” and tactics didn’t help me find success. It was not that simple and untrue equation that failure = you didn’t try hard enough. 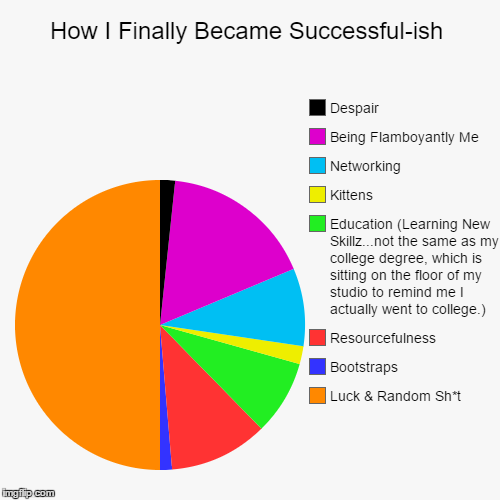 Not so say that working hard and not giving up isn’t important, but I think this pie chart gives a more accurate slice of career life…at least from my perspective! This entry was posted in Uncategorized and tagged bootstraps, career advice, freelance life, full time artist, kittens, Lolcats, milestone, pie, pie charts, retirement, voice acting, voiceover. Bookmark the permalink.